fantail flo: The Best of Modest Fashion- my Zalinah White Review! The Best of Modest Fashion- my Zalinah White Review! https://www.instagram.com/zalinahwhite/Hey girls! Have you ever wanted to dress modestly yet still look super stylish and chic? Zalinah White is a newly launched boutique that sells the most elegant, beautifully designed modest clothing that I’ve seen in a long time. I stumbled across them on Instagram (@Zalinahwhite) a while back and couldn’t stop looking at their website ever since. Zalinah White just launched a few weeks ago, so everything on their shop is brand new and totally unique as part of their first collection. A bit about Zalinah White- inspired by the needs of the modern woman who loves stylish, dazzling pieces with very feminine yet classic styles, the brand aims to provide modest yet appealing clothing to the everyday fashionista out there. 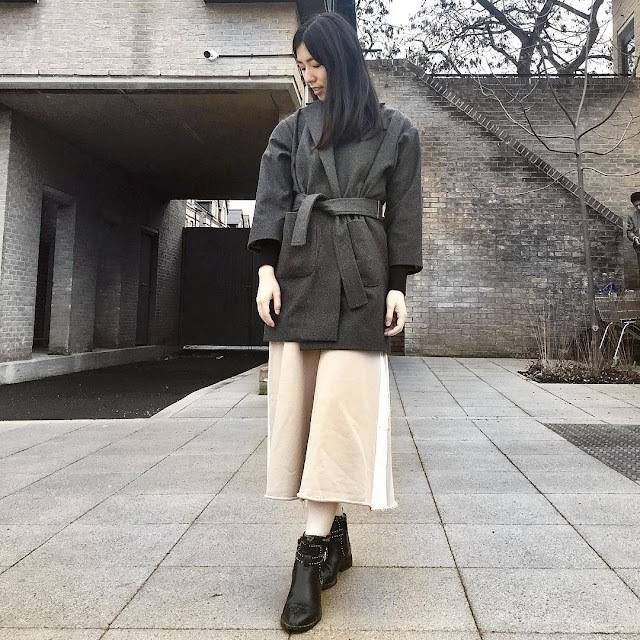 Their styles include lovely long maxi dresses, woollen boyfriend coats, long dresses in bold polka dot patterns and modest clothing like Abayas and fitting trousers that cover up without looking frumpy or bulky. They also design, source fabrics and produce every garment in the UK. This means that every item from Zalinah White is extremely high quality and beautifully made - nothing is outsourced or sent to sweatshops in Asia. They are also are an officially verified Make It British member. I just adore brands that help the local market! 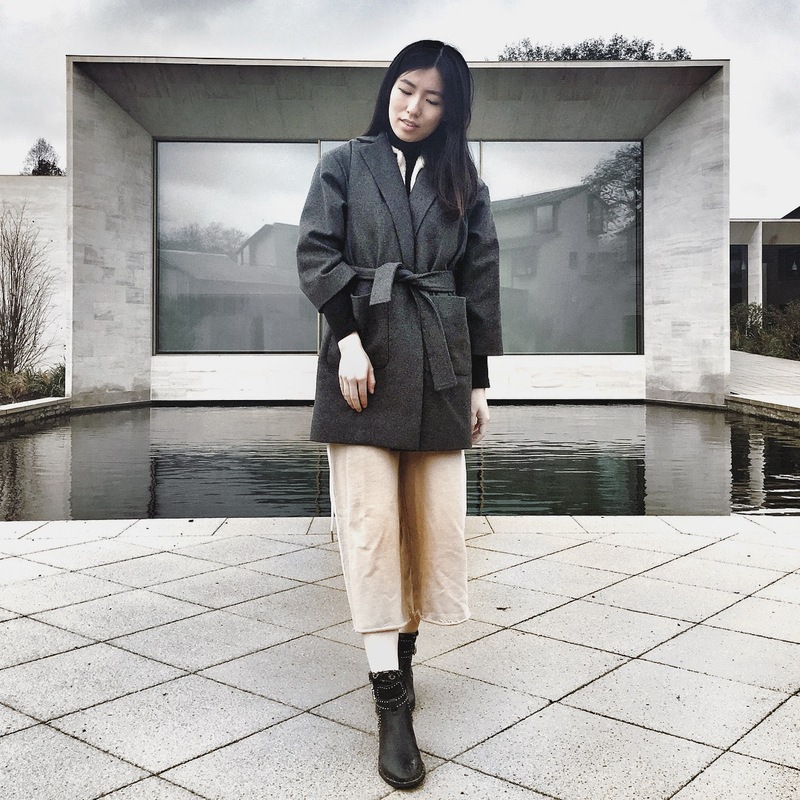 I was lucky enough to be able to review their amazing Petite Boyfriend Wool Coat which comes in a lovely dark grey. This beautiful coat is extremely high quality, because it's made from 100% wool. This coat is hence one of the warmest and softest coats that I've ever owned, not that I have many coats anyway! 100% wool is great because it keeps even the coolest breezes out. Also, the stitchings and quality of the coat as a whole is fantastic, as it is fully lined and comes with a little belt which loops around the waist. As for the design, the coat has slightly shorter sleeves, which is special because it sort of looks like those coats you see in the magazines! In fact, I think this coat is much better than many coats you can find on the high street. The coat is beautifully oversized, though it isn't too loose or too slouchy like some of the other boyfriend coats that you can find. I love how it flatters every body shape, and it looks so good with a dress or some culottes and boots! In terms of the fit, the coat is pretty perfect as I got a size UK8. I'm usually an 8, and the coat is very true to size. Everything clings onto the right places, and it's really rare to find such a beautifully tailored coat. In fact, Zalinah White also sells other blazers and jackets, which all look super unique and cool. They have a lovely Nour Cropped Blazer which I think also looks lovely with anything, and I also love their range of maxi dresses and skirts! All in all, I can't thank Zalinah White enough for this wonderful opportunity. As one of the most exciting and upcoming new brands, Zalinah White offers trendy, modest clothing for women of all ages. Their impeccable quality and designs really impressed me, and I absolutely adore this coat! Best of all you can use "FLO10" for 10% off!